It offers an entrance opening onto a very large living room nice and bright with an American kitchen all overlooking a wrought iron balcony, a wide corridor serving 4 bedrooms, a shower room and 2 toilets. In a condominium built in the 1900's with a concierge. The apartment benefits greatly from its southwest exposure, as it is bathed in daylight. A cellar complete this property. Charges: 400 Euros per month. Property tax: 1,300 Euros. 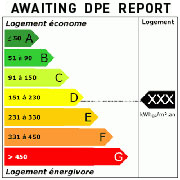 DPE: in progress. 2 lots for sale. Building with elevator.